In a vision, I entered an empty room of an old house. The room was filled only with the sunlight that was spilling through an open window, and a warm breeze blew through, as well. 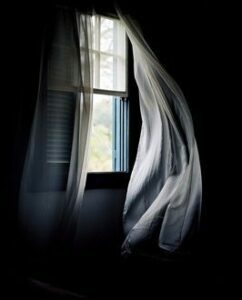 As I drew closer to the open window, the hanging sheer billowed with the breeze and wrapped round me as if to draw me even closer to see what was on the outside. Still wrapped round me it instantly became a dress of flowing white silk. I stood frozen, mystified, bewildered, in awe. What was this place? And why have my clothes been transformed? I knew there was still more, much more, to see. I saw this vision while I was running an errand recently and immediately pulled into the nearest parking lot to quickly jot it down into my phone. God so often speaks to me in this way – through impressions, visions. I’ve learned over the years to always make note of them and continue to pray for greater and/or ongoing direction. My poem “The Trail,” and this vision, speak to me of transition, of new things the Lord has yet to reveal. I’m excited about things to come. With God, there’s always so much more to see!